Sir William Orpen (1878-1931) is considered one of the best British portrait painters of his time. He was educated in Dublin and then at the Slade School of Art where he was awarded numerous prizes and medals for his impressive abilities as a portrait painter. Orpen was praised and celebrated by his contemporaries and critics and when Winston Churchill viewed his own portrait he said " [this is not] a painting of a man, but the painting of a man's soul." 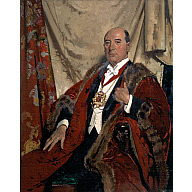 Orpen's portrait of Sir Andrew Lewis commemorates his term as Lord Provost of Aberdeen. Lewis was a senior partner with his family company, Messrs. John Lewis & Sons, Ltd. Shipbuilders and Engineers. Not only was he a keen businessman, he also played an important role in raising funds for a new hospital in the city. This portrait highlights Orpen's ability to capture character and in this case, warmth and sentiment.